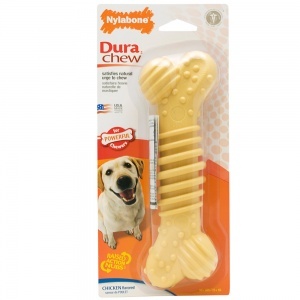 DuraChew is designed specifically for powerful chewers. Chicken flavor will keep your dog entertained for hours discouraging destructive chewing. Fight boredom by giving your dog DuraChew throughout the day. Raised texture helps clean teeth and contributes to healthy teeth and gums. Multi-textured bone will help satisfy your dog s natural urge to chew.